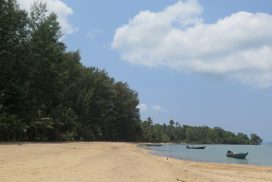 Koh Mak is the third largest of the Koh Chang Islands, with a size of approximately 16 square kilometers and a local population of around 1000. Unlike its neighbours at Koh Chang and Koh Kood, Koh Mak has a mostly very flat terrain of natural forest sitting alongside extensively planted rubber and coconut trees, with a coastline of long white beaches such as Ao Kao Beach and Ao Suan Yai Beach, looking out onto azure blue seas. 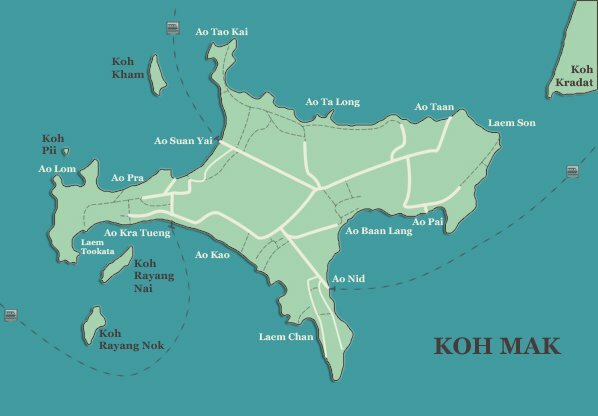 95% of Koh Mak is privately owned by 5 families and as a result of this, its development has been carefully managed and restrained, with smaller scale bungalow operations and boutique resorts rather than larger corporate hotels. You can Contact Us with your questions about the Koh Mak. We are only too happy to help and can book private transfers to and from the island, buses and boats. We can also help with your planning as you combine a Koh Mak holiday with a trip to Koh Chang, Koh Kood, Koh Wai or Cambodia. 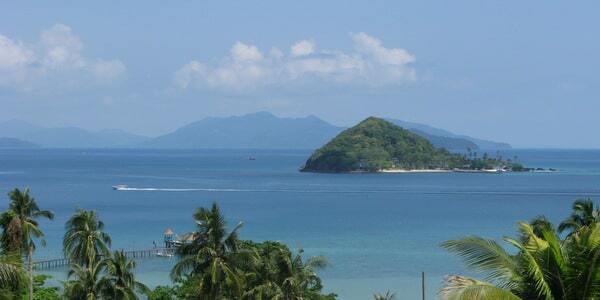 Koh Mak resorts and bungalows are centred on the two principal beaches at Ao Kao and Ao Suan Yai. Other resorts are found on the more remote south, east and north coasts. Top end resorts include Seavana Resort, Plubpla Resort and Mira Montra Resort. Rooms here start from 4,500bt depending on the time of year. Koh Mak does have two small hotels at Makathanee Resort and Islanda Hotel with the cheapest rooms at 1,500bt going up to 5,000bt and more. Little Moon Resort, Cococape and Ao Kao Resort serve the boutique market, with plenty of other mid range small resorts and bungalow operations featuring Seabreeze, Baan Koh Mak, Koh Mak Resort, Bamboo Hideaway, Holiday Beach Resort and Skybeach Resort among others. Backpackers and travellers can find budget accommodation at Joe’s Corner Hostel, Monkey Island, Island Huts and Baan Ing Khao – bungalows range from 300bt upwards. Find a resort, book a room here in our full area by area guide. Koh Mak is reached from Laem Ngop Pier by speedboat and from Laem Sok Pier by catamaran. Private transfers by car or minibus are the easiest way to make either boat connection, with prices starting from 4,000bt from Bangkok. You can also fly to Trat Airport, followed by a 25 minute transfer to Laem Ngop. Public buses, in particular the 999 from Ekamai Bus Station or the Boonsiri bus/boat ticket from the Khao San Road area, are a cheaper alternative. Share minibuses to the Koh Chang piers or Trat complete the options. Koh Mak is a also a great place to start if you want to explore the other islands of Koh Kood, Koh Chang or Koh Wai, with daily speedboat connections and a new catamaran back and forth. All the information on getting to Koh Mak is here. Head here for all the information and full details on private transfers from Bangkok hotels, Suvarnabhumi Airport, Don Mueang Airport and Trat Airport to Laem Ngop Pier for Koh Mak. We also provide international transfers from Siem Reap, Sihanoukville and Phnom Penh in Cambodia. Prices for a Bangkok to Koh Mak transfer start at 4,000bt, car 2 persons, excluding boat tickets. Head here for all the information and full details on buses from Bangkok, including the 07.45am and 09.00am 999 to Centerpoint Koh Chang Pier, from where you simply hop in a songthaew cab, 50bt per person, for the 10 minute journey to Laem Ngop Pier for Koh Mak. You’ll also find details and the chance to book the 05.00am or 07.30am Boonsiri combo bus/boat which leaves from the Khao San area to Laem Sok Pier, arriving at 12.45pm or 15.30, 900bt per person. We also give a full round-up and timetables for hourly buses and share minibuses from Ekamai Bus Station to Trat as well as other services. Timetables, prices and booking here. From Laem Ngop Pier, speedboats run throughout the day from 10.30am till 16.00, 450bt per person, duration of just under an hour. There are also 2 daily catamarans from Laem Sok Pier, Koh Kood’s pier, at 10.45am arriving at 12.45pm and at 14.20 (till 31/1/19), arriving at 15.30, 400bt per person. 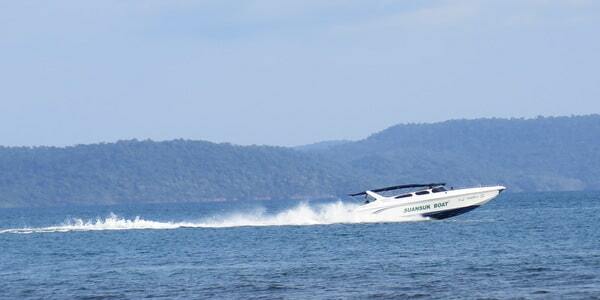 Speedboats go from Koh Mak to Koh Chang and Koh Kood 3 times daily as well a wooden boat and a new twice daily catamaran. Book all the boats here. Bangkok Airways flies from BKK Suvarnabhumi Airport into Trat Airport, with the PG301 landing at 09.20am and the PG305 landing at 12.40pm making the boat connections over at 10.30am and 14.00 respectively. To reach the pier from Trat Airport, you will need private transport by car or minibus, prices from 900bt. Coming back, you can use four flights, PG302 departing at 10.10am, PG306 departing at 13.10, PG310 departing at 16.25 and the PG308 at 18.15. Prices start at 2,850bt per person excluding taxes for a websaver – it needs to be booked well in advance. The main beaches on Koh Mak are Ao Kao Beach and Ao Suan Yai Beach on the south west and north west coasts respectively. Both are lovely long stretches of sand with shallow, clean blue waters. Ao Kao has resorts and bungalows spread out along its length, with a narrow little road running behind offering a few restaurants and shops, everything very laid-back. Ao Suan Yai is home to just a few of resorts at the southern end, its northern end wild and undeveloped. Ao Nid is the island’s administrative area, with a clinic, school, temple and the main pier. The other coasts – south, east and north – are more remote affairs, but they do still have some great resorts scattered about, as well as a couple of fabulous untouched beaches. Tour the island here in our full beach by beach guide. On the south west of the island, Ao Kao is Koh Mak’s premier beach, home to Ao Kao Resort, Lazy Days, Makathanee Resort, Island Huts, Baan Koh Mak, Skybeach and Holiday Island amongst others. Behind the beach, there is a good selection of laid back restaurants, two dive shops, cafes and a couple of bars. The very charming little beach of Laem Tookata is in the far western corner with the islands of Koh Rayang Nok and Koh Rayang Nai offshore. Leelawadee Speedboats from Laem Ngop and Kai Bae Nor Nou which shuttles between the Koh Chang islands, both use the pier. Explore Ao Kao Beach here. The south and east coasts of Koh Mak do not have the same quality of beach as Ao Kao and Ao Suan Yai, but they are still great places to explore and stay. Resorts on the east coast include Plubpla, Little Moon Villa, Seabreeze, Bamboo Hideaway and Pano. There are restaurants around and about such as Koh Mak Seafood and the popular chill-out bar at Banana Sunset. Ao Nid is home to the police station, clinic and the main pier used by Suansuk, Seatales and Boonsiri. Laem Son is in the far north east corner, a fabulous untouched beach with the island of Koh Kradat offshore. Explore the South and East Coast here. Ao Suan Yai, like Ao Kao, is a terrific sweep of uninterrupted sand and shallow waters. Resorts feature Seavana, Koh Mak Resort and Happy Days, with a nice beach bar restaurant at Thai Sabay. Panan Speedboats from Laem Ngop and Bang Bao Boats, which shuttles between Koh Chang, Koh Kood and Koh Mak, both use the pier. At the far end of the beach, there are some terrific forest trails which bring you out on the deserted Turtle Beach. The island of Koh Kham lies offshore. Explore Suan Yai Beach and Ao Pra Beach here. The north coast has just two resorts, Cinnamon Art and Green View, both wonderful isolated affairs located on rough stone beaches in an area known as Ao Taan. Towards the west at Ao Ta Long, Kok Mak’s original fishing community still has its home. Its easily accessed on the road coming from Ao Suan Yai and provides a fascinating glimpse at Thai island life. There are also numerous paths and trails running along the coast and in the forest, perfect to explore on bicycle or on foot. Explore the North Coast here. Koh Mak is a very laid back spot so most visitors to the island just kick back and relax, but it does have some terrific things to do including diving and snorkeling, with daily boat trips heading over to the coral reefs at Koh Rang, just 20 minutes away. Also out on the water, the island now has a small sailing and windsurfing scene and kayaking over to the offshore islands is very popular. On land, you can hire mountain bikes to take advantage of the island’s flat, quiet roads and numerous forest trails. To complete the round up, Koh Mak offers a decent and long running cooking school, a Muay Thai gym and even a disc golf course. Visit here for all the Koh Mak activities. Head here for all the information and and guide prices for Koh Mak’s diving scene, with the two companies, BB Divers and Koh Mak Divers. We also cover all the snorkeling options over to Koh Rang, Hobie, windsurfer and kayak rental and day trips to the offshore islands. Book Koh Mak diving here. Our guide to the different bicycle paths and walking trails on the islands across all the coasts, what to find off the beaten track when out and about exploring. Look out for Laem Son Beach, Laem Tookata, Turtle Beach, The Kingdom of Somchai and the oldest house on the island at Ao Suan Yai. 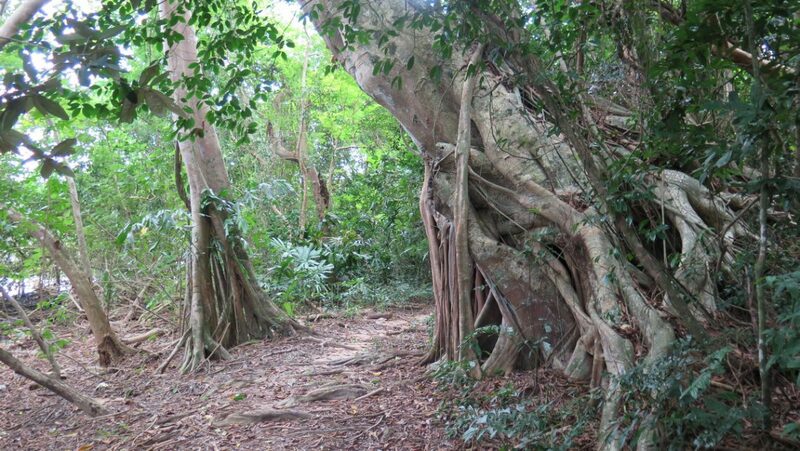 Explore Koh Mak bicycle paths, walking and trekking trails here. Our restaurant guide goes around Koh Mak, picking out the best spots. We cover everything from seafood at Koh Mak Seafood, Thai at places like Kon Ginsen, Table Tales and Clay Pot, western at Koh Mak Pizza, Food Art Hut or Swiss Sawasdee, coffee shops at Coffee and Sweetcake and Ball Cafe and much more besides. All the Koh Mak restaurants here. Our guide to Koh Mak nightlife and bars gives you the lowdown on where to head for a relaxed night out and some live music, Koh Mak style – Monkey Bar, Artist’s Bar, Thai Sabay Bar, Cafe del Mak and Banana Sunset to name just a few. Look out too for the annual clubbing festival, Thaibreak, which runs from dusk till dawn over 3 days in late March. All the Koh Mak nightlife here. Just offshore from Koh Mak are 5 small islands, with it possible to stay on two of them, Koh Rayang Nok and Koh Kradat. Koh Kham lies off Ao Suan Yai beach, with an unfinished luxury resort. You can kayak to them all, though bear in they do have entrance fees, Koh Kham at 200bt per person, Koh Kradat and Ko Rayanag Nok at 150bt per person. Alternatively, you can take a day trip, with a speedboat tour a great way to see them all in one day. Explore the Islands offshore from Koh Mak here.